You have just entered a unique piece of Texas history Austinites are proud to call their own. Originally an ornamental Iron Work shop owned and operated by the Weigl family, this little tin building was converted into The Iron Works BBQ in 1978. Shortly after opening their doors, the State Historical Commission registered the property as a historical site, honoring the Weigls and their legacy. This is their story. In 1913, looking for a better life in America, Ironworker Fortunat Weigl, Sr. along with wife Anna, their sons Lee and Herbert, left Bavaria, Germany. The family loaded their belongings inside a makeshift box made out of their kitchen table and boarded a ship called the SS Breslau. Having no radio in Germany, the Weigls often read books to their sons for entertainment. The family particularly loved the Wild West for its unabashed and uncompromising Cowboy stories. These stories and an adventurous spirit are what led the family directly to Texas. After arriving on Ellis Island with the twenty dollars required of immigrants, the family steamed South to Galveston, Texas, where they finally boarded a train and landed in Austin. Fortunat supported his family as a construction worker until 1922. It was in that year Peter Mansbedel, a Swiss woodcarver, approached Fortunat and asked if he would be interested in creating iron wall fixtures for a project in San Marcos, Texas. Fortunat agreed and Mr. Mansbedel advanced him $75.38 for a few tools, a sack of coal, and some flat iron. Fortunat used his new found fortune to make a down payment of $20.00 for his new business. Weigl Iron Works was born in Austin, Texas. However, shortly after losing his lease at Exposition Boulevard, Fortunat approached his friend, Mayor Tom Miller, for help. Miller knew where Fortunat could find cheap property, but warned him of the “big hole in the ground.” Not slow to turn down a good offer, Fortunat invested once again on a small plot of land located on Red River. Using materials left from the re-building of the State Capital, Fortunat quickly filled the hole and the Weigl’ operation found a new home in 1935. Shortly after their opening, disaster struck. On June 5, 1935, one of the worst floods Austin has ever seen raged throughout the city. After the waters receded, the Weigls were forced to cut out pieces of floorboard to scrape massive amounts of mud into the basement. These cutouts can still be seen, but are covered with IWB license plates. 7 feet flood scars along the walls in the the dining serve as a reminder of the forces of nature. The words “Flood Stage, June 5, 1935” are written above them. As time progressed, a much stronger and wiser Fortunat joined by his sons, Lee and Herbert, continued to build some of the most beautiful iron works still prevelant throughout the state of Texas. A prime example is the weather vane located on the peak of the IWB roof. It was made by Lee Weigl in 1922 at the age of 13. This weather vane has never been lubricated– a tribute to his ingenuity and artistry. Weigl craftsmanship continues to grace the halls of the State Capital, Texas A&M University, Laguna Gloria Art Museum, and many of the historical homes around Austin. LadyBird Johnson has true admiration for the Weigl’s art. She was especially fond of a repousse mask of her late husband (President Lyndon B. Johnson) Lee fashioned for her. After Fortunat’s death in 1973, Lee and Herbert continued to run the family business until their retirement in 1977. During their years they fashioned pieces for the celebrities of their era–icons such as Jack Benney, Lucille Ball and Bob Hope. The restaurant is proud to display those brands where patrons can readily see and enjoy them. It fascinates our family to contemplate the trials and tribulations the Weigls endured for this simple, red tin building. One that has evolved into something a bit different, but with the same pride and skill as the one before it. We are in awe of the history and legacy this building has seen along with the progression it has maintained. 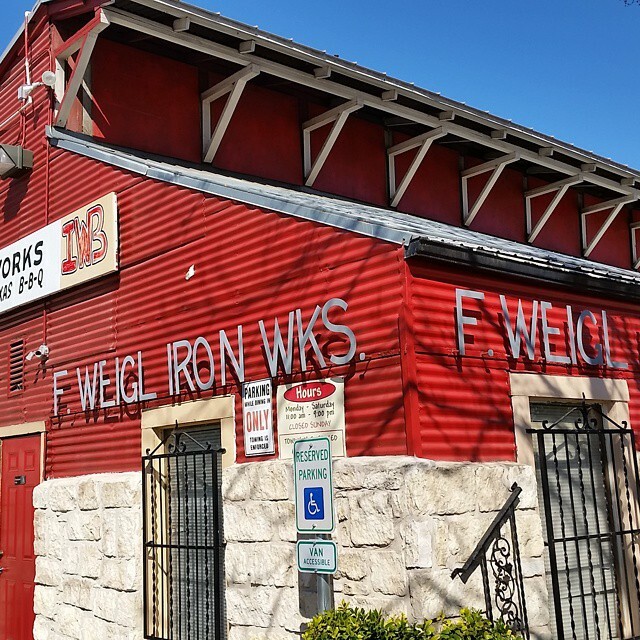 In short, The Iron Works BBQ is a family owned and operated business that has been serving Real Texas Barbecue in a country atmosphere since 1978. Like the Weigl’s, we have enjoyed great success thanks to the folks in and around the Austin area. Modern day celebrities have walked through our doors. Folks like Kevin Costner, Leonardo Dicaprio, Bob Dylan, Jay Leno, but more importantly, folks like you. Now that the millennium has passed and progression continues to beckon, we are taking the Iron Works BBQ, its history and indomitable spirit even further because it demands nothing less. Our web site offers easy access to our sauces and seasonings, pictures of the Weigls when it all began, directions to our establishment. We even have a full catering service to satisfy our customers.